Anytime crops are too wet or too dry, there is a possibility of the crops growing molds and mycotoxins in the field. This can lead to ensiled forages and grains being fed that are loaded with molds, mycotoxins or butyric acid. The increase in rainfall has created issues for planting and harvesting. Symptoms that you may observe in your dairy animals affected by mycotoxins include: animals being off-feed, ketosis, displaced abomasums, pronounced milk decrease and diarrhea. 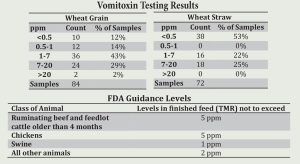 Because of the wet growing season, Dairyland Labs has been testing the 2014 wheat crop for vomitoxin. 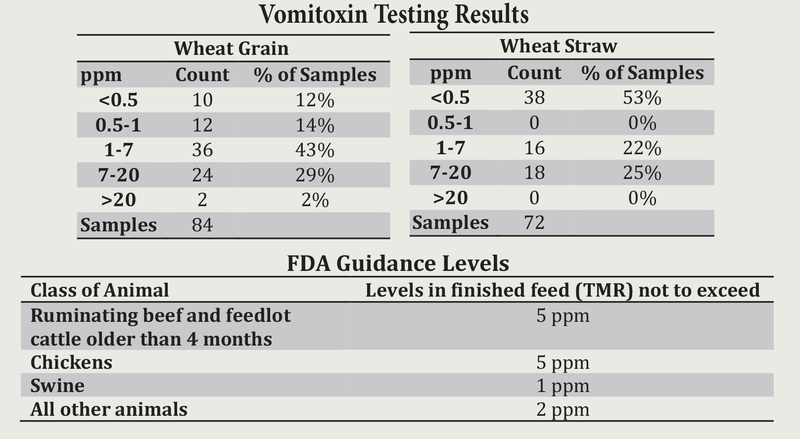 The charts below summarize their findings for vomitoxin and list FDA vomitoxin guidance levels. If you suspect any molds or mycotoxins in your feed or grain, make sure to get it tested. Contact the office staff at Crystal Creek® and they can send you a packet to test your feed through Dairyland Labs. If molds or mycotoxins are confirmed in your forages or grains, make sure to feed a mold and mycotoxin binder. Crystal Creek® offers two highly effective mycotoxin binders. Fuse 207™ , formulated with concentrated glucans and polarized ions, is highly effective against many types of mycotoxins. However, when dealing with mycotoxins such as DON/vomitoxin, we recommend the use of Fuse 207™ in conjunction with Crystal Creek’s® Mycotex™ . Thank you for your question! Sources: Dairyland Laboratories, Inc. Whitelow, L.W., R.L. Nebel, and W.M. Hagler, Jr. 1994. The association of deoxynivalenol in grain with milk production loss in dairy cows. Pp. 131-139. In: G.C. Llewellyn, W.V. Dashek and C.E. O’Rear, [eds. ], Biodeterioration Research 4. Plenum Press, New York. Adams, Richard S., Kenneth B. Kephart, Virginia A. Ishler, Lawrence J. Hutchinson, and Gregory W. Roth. Mold and Mycotoxin Problems in Livestock Feeding.” Dairy Cattle Nutrition [Penn State Extension]. Penn State Extension, n.d. Web. 17 Sept 2013.